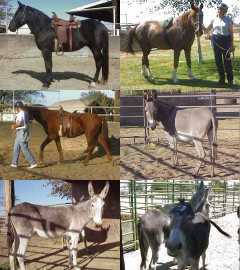 Five days of hands-on wild horse & burro gentling and training. 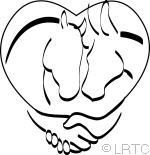 Wild Horse Workshops and Wild Horse U. are educational projects involving LRTC and BLM. They involve several days of actual wild horse gentling and training activities and wild horse adoptions. Interested parties can register to participate "hands on" in the pens or they can simply come and spectate for free from the stands. 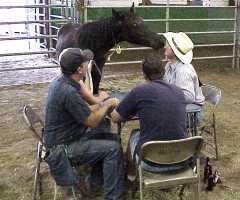 Participants can adopt horses at the workshop. 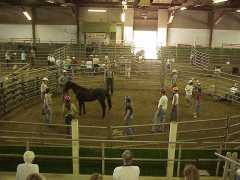 Approaches taught include "Gentling Wild Horses 101," the "Bamboo Pole Method," the "Safe Squeeze," square pen gentling, conventional round pen, "Human Round Pen," "Focused Training, burro training and basic saddle starting. To go to the workshop site please click HERE! Get your horse used to all sorts of strange objects. Teach him to think rather than react to the unexpected. Contact Sharon Lamm or Betty Retzer for details. to view photos of recent workshop activities. Wild horses at the Salt Lake Olympics? 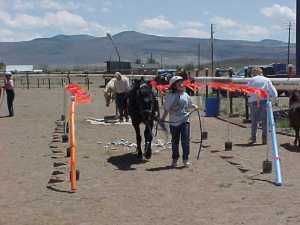 Volunteers have gentled and trained several wild horses and burros that appeared at the 2002 Olympic Winter Games. Click here for details. We have taken in a number of rehabilitation and rescue horses this fall. All found good homes. Click here to learn about the project and see their stories. 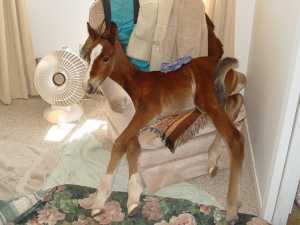 A Horse in the House! Read the story about the volunteers and Koby the orphan mustang. 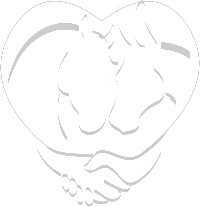 Programs listed that are produced by other trainers and groups are solely the responsibility of those entities.